Media Club: Ram Charan Tej launched MAA Stars mag 3rd Edition. 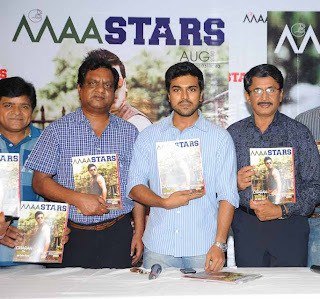 Ram Charan Tej launched MAA Stars mag 3rd Edition. ‘MAA’ Stars monthly magazine August version was unvieled by Ram Charan Tej on Aug 10th.at Chiranjeevi’s residence. MAA president Murali Mohan, Ram Charan Tej, AVS, Ali, Bangalore Padma, Sekhar, Murali Raavi, etc., participated in this programme. Chiranjeevi and Ram Charan featured on the cover page of August version of MAA Stars magazine. 0 Response to "Ram Charan Tej launched MAA Stars mag 3rd Edition."